Third largest island in the world, Borneo is known for its lush jungle and incredibly diverse flora and fauna. 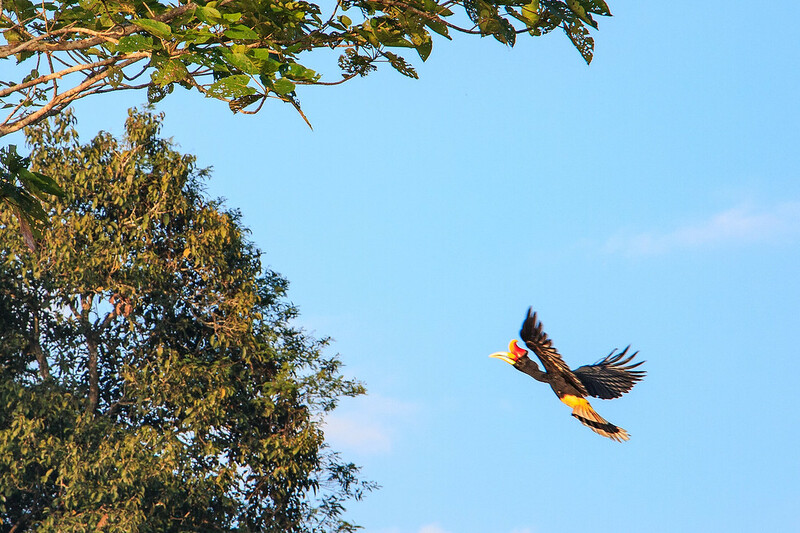 Unfortunately, it is also known for having lost more than half of its primal rainforest due to oil palm plantations. The tropical rainforest and climate of Borneo are the perfect conditions for many animal species. 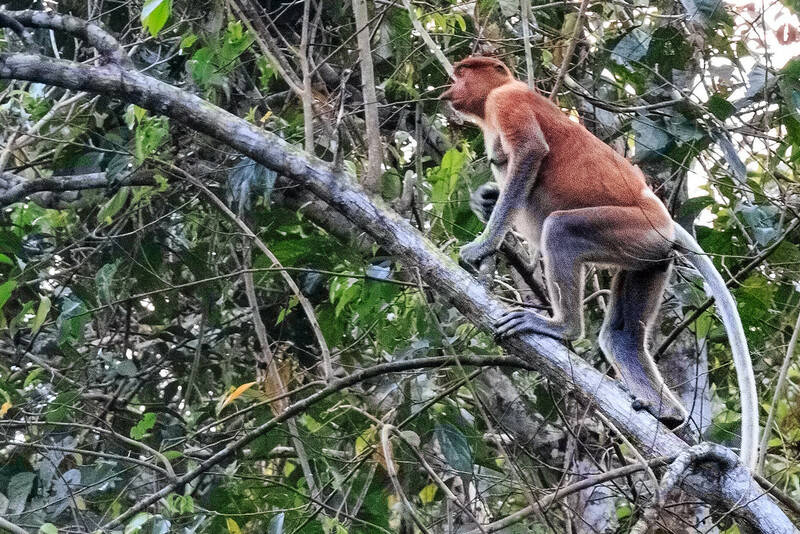 Amongst Borneo’s mammal inhabitants, you can see the Sumatran rhino, clouded leopard and the pygmy elephant, as well as many species of primates including orang-utans and proboscis monkeys. 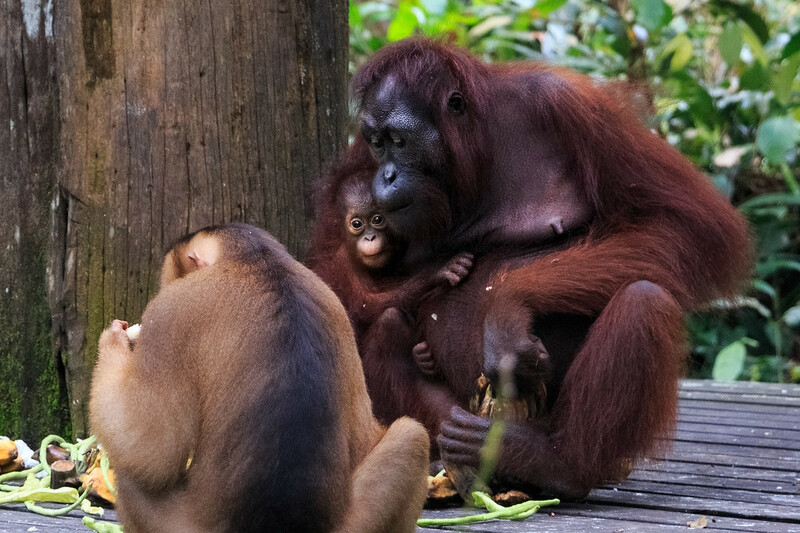 Borneo is also, with Sumatra, the only place where elephants, orangutans, tigers and rhinos live together. 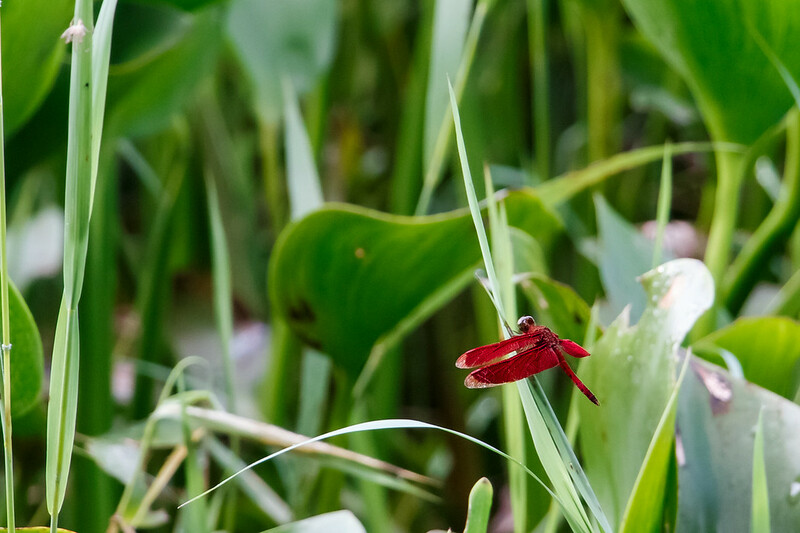 More than 15,000 known plant species can be found in Borneo’s rainforests, and even more species are yet to be discovered. 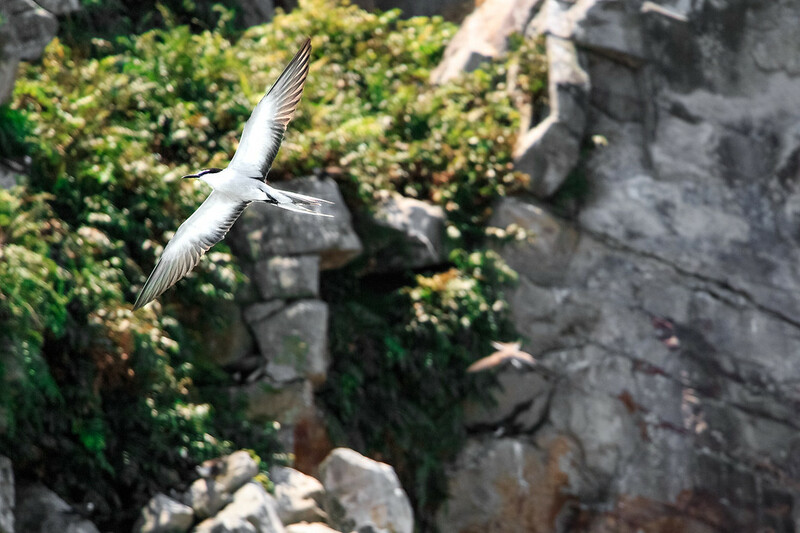 The bird lovers will also be satisfied with many sightings of birds, especially alongside rivers, mangroves and coastlines. 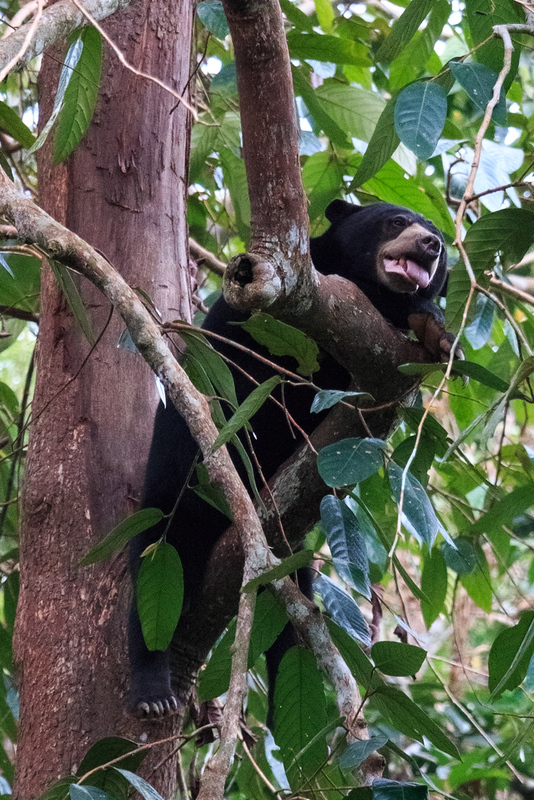 Here are a few of the animal species we had the chance to spot while visiting the provinces of Sabah and Sarawak, in Malaysian Borneo. 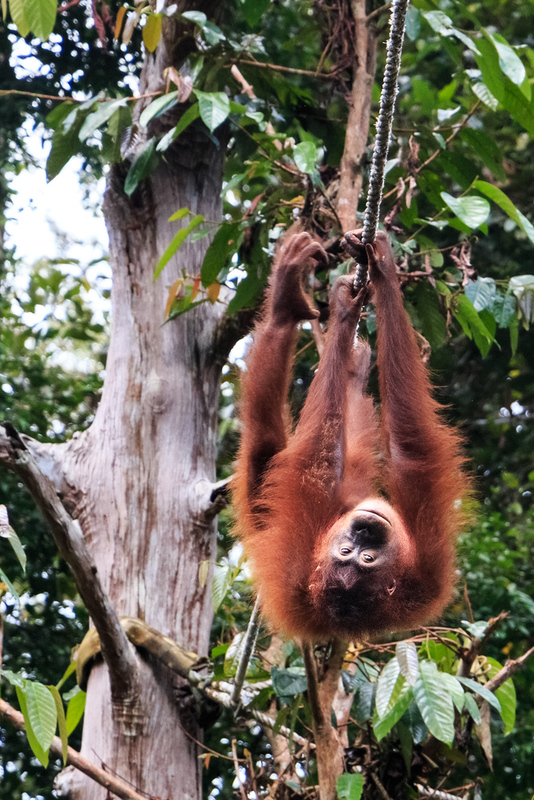 When young orangutans are rescued they firstly go to the Nursery to learn the essential skills they need in the jungle, such as finding food, building nests and climbing. Once ready, they move to the Outdoor Nursery where they are free to roam anywhere. They are still fed 2 times per day but some of the orangutans don’t even come to the feeding platforms anymore as they can manage to fetch their own food. Largest tree-climbing mammal and the only great ape that can be found in Asia, the Borneo Orangutan is an endangered specie, mainly due to deforestation. We can estimate the loss of orangutan’s population on Borneo at around ⅓ because of forest fires. 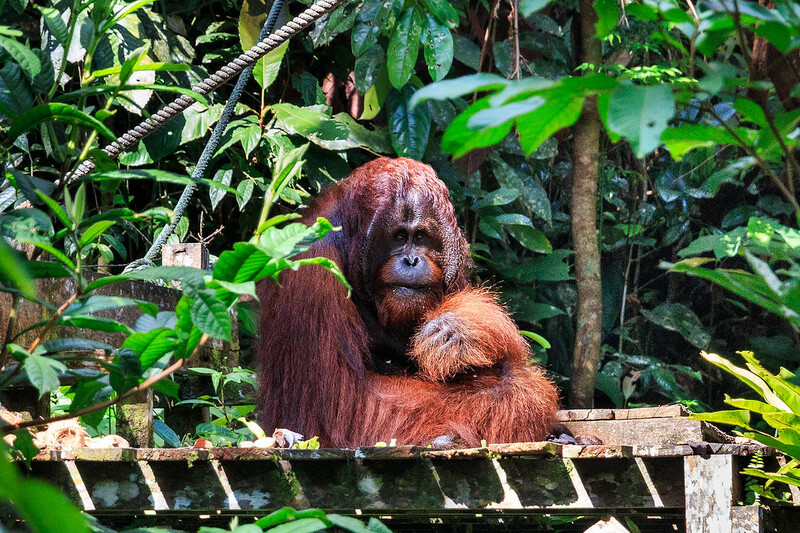 Orangutans are solitary primates but they share the forest with other primate species including gibbons, macaques, tarsiers, loris and proboscis monkeys. 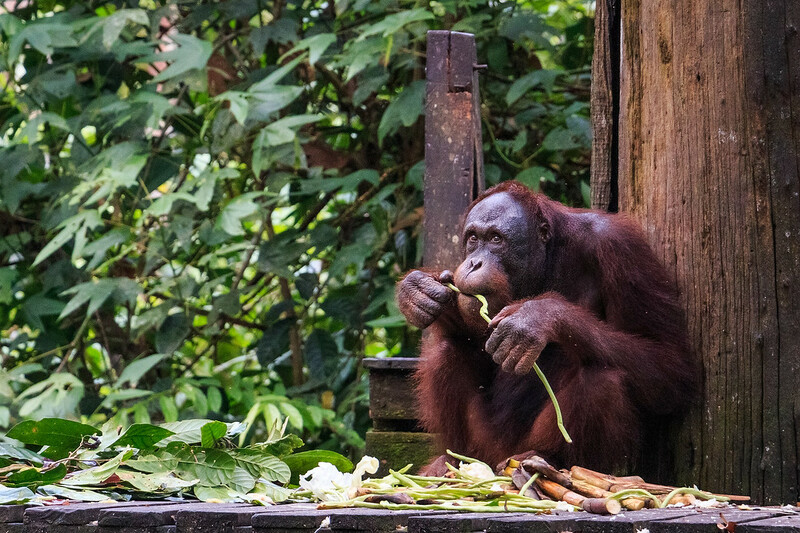 We didn’t manage to spot a wild orangutan during our river cruises on the Kinabatangan river so we visited the rehabilitation centres in Sepilok and Kuching, where they are semi wild. The Orangutan Rehabilitation Centre in Sepilok rescues young orphaned orangutans and aims at returning them back into the wild. 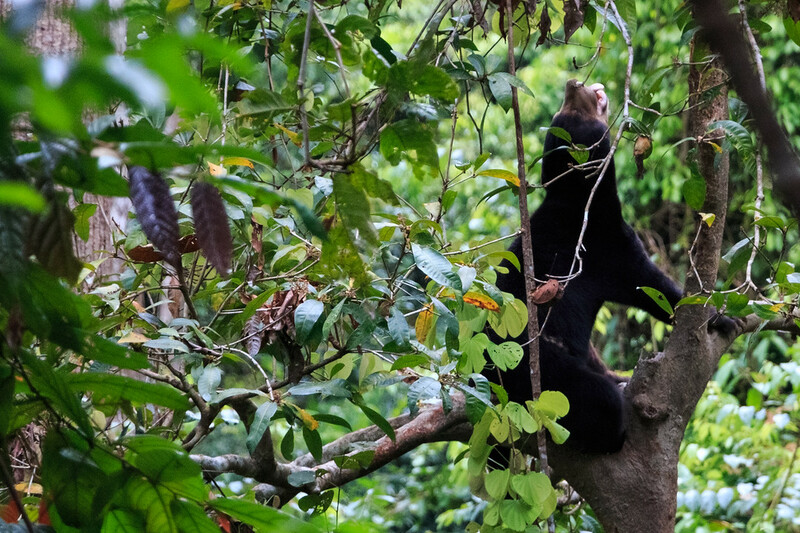 The Malaysian sun bear is the smallest bear on Earth and only lives in Southeast Asia. They are threatened by deforestation, bear parts and pet trade poaching. 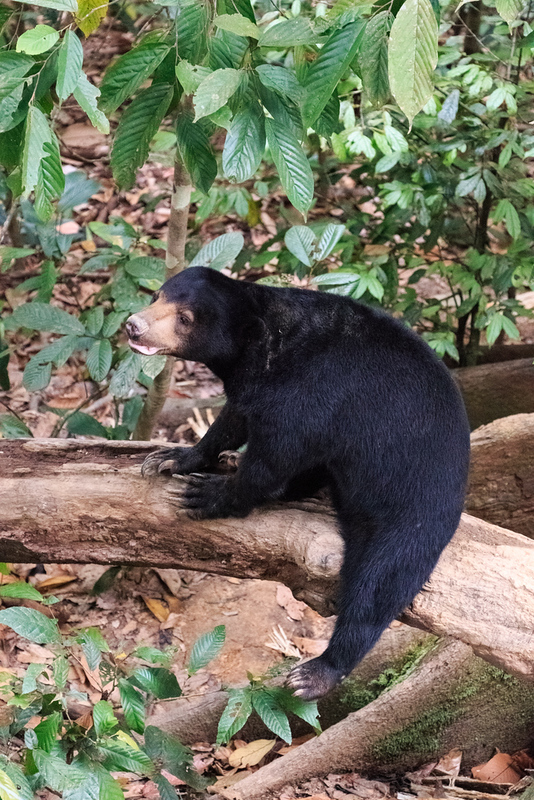 The aim of Bornean Sun Bears Conservation Centre is to rescue young sun bears found captive. 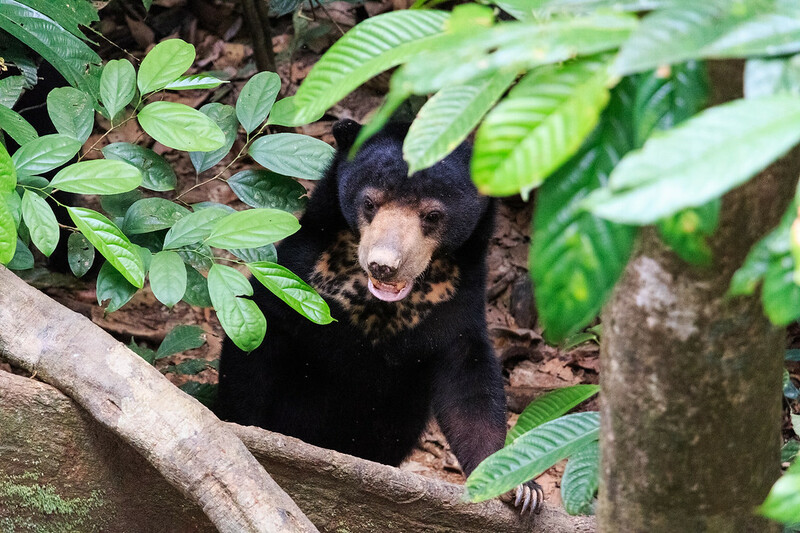 Today, there are 44 rescued sun bears living a happy life at the Conservation Centre. They reside in a large forest, enclosed for their protection, but with a goal to rehabilitate them back into the wild. The only place you can find the Borneo pygmy elephant today is in the Northeast part of the island, in the Kinabatangan river area in Sabah (Malaysia) into the region of east Kalimantan in Indonesia. The population of Pygmy Elephants in Borneo has decreased at least 50% in the 3 last generations and continues to be endangered today. 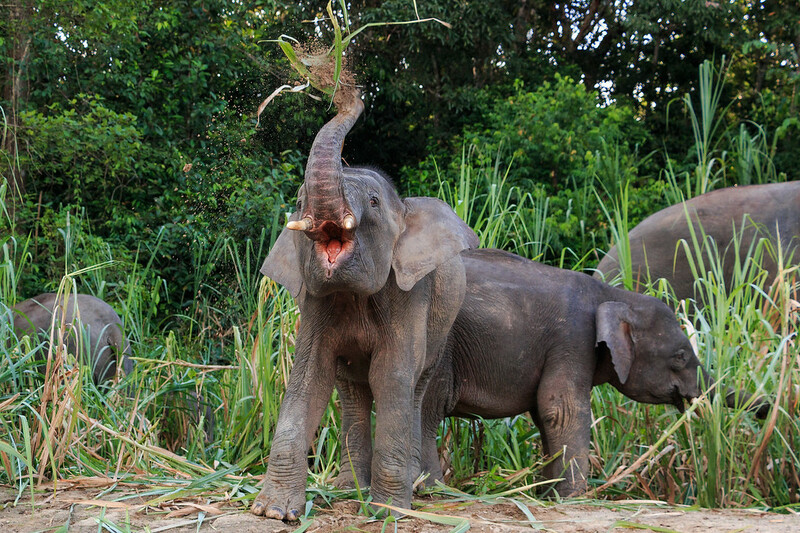 When I heard there were Pygmy Elephants in Borneo and we had a chance to see them, my heart melted. I am a huge fans of elephants ! 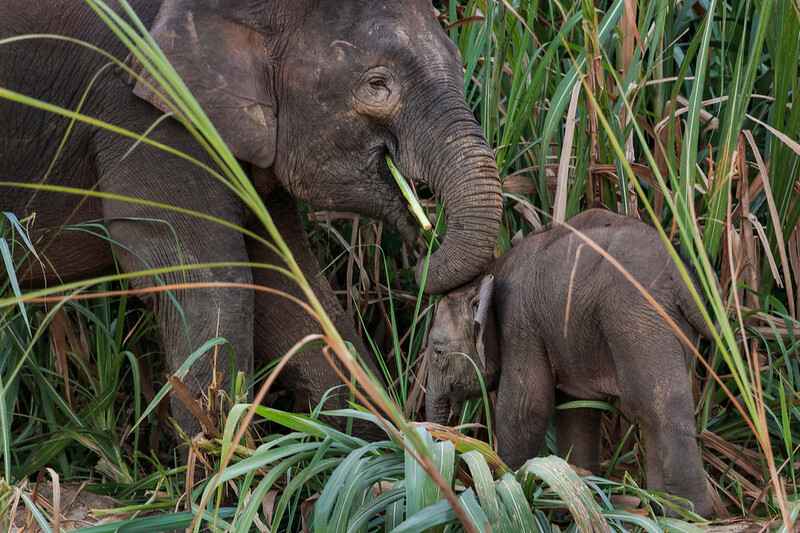 Borneo Pygmy Elephants have larger ears, longer tails and straighter tusks than Asian and African elephants. They are the smallest elephants in Asia. 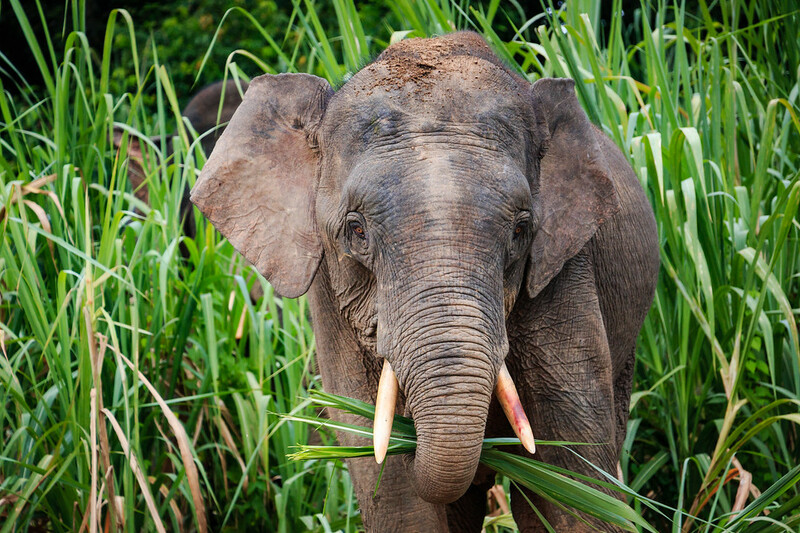 The loss of their natural habitat due to deforestation for timbering and oil palm plantations is the biggest threat to the Pygmy Elephants. Mammals of this size usually need large forest area to breed and feed. Today, the WWF works with local communities to regulate forestry into a more responsible one. You know this funny looking monkey with its long nose ? 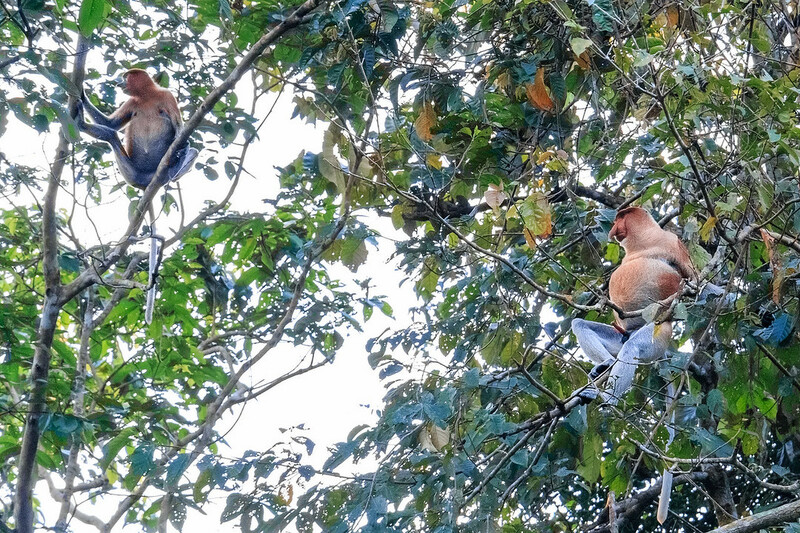 It’s called a proboscis monkey and it is endemic of Borneo. They mostly are found near the coasts and riversides. 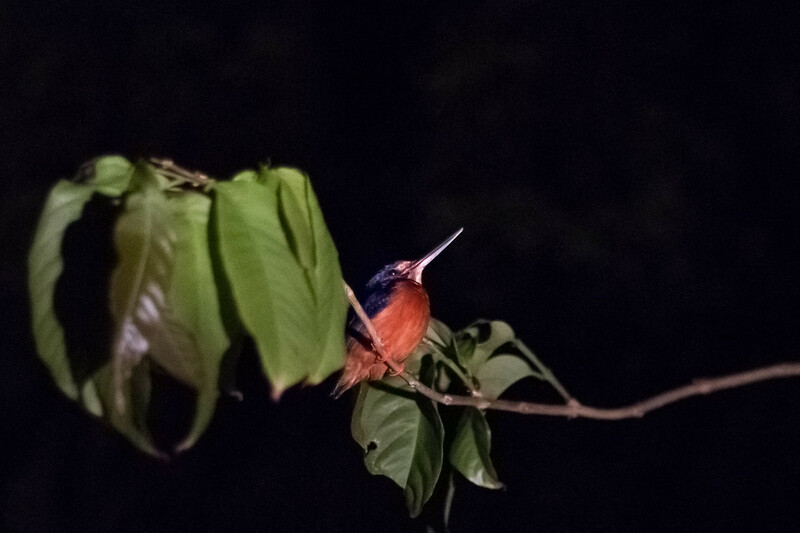 We were lucky to see plenty of them during our Kinabatangan river cruises, especially in the evening, as they are more active at that time of day. 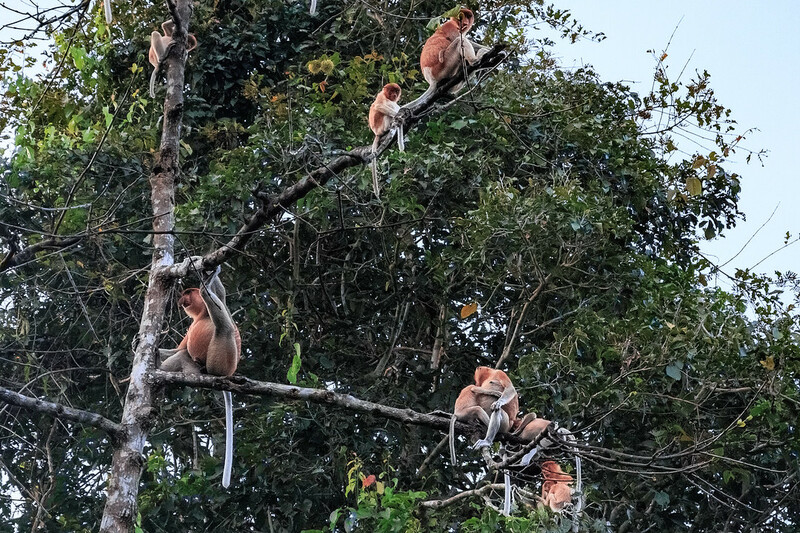 Deforestation and hunting, especially the golden hair babies for pet trade, have reduced the population of proboscis monkeys drastically over the past few years. 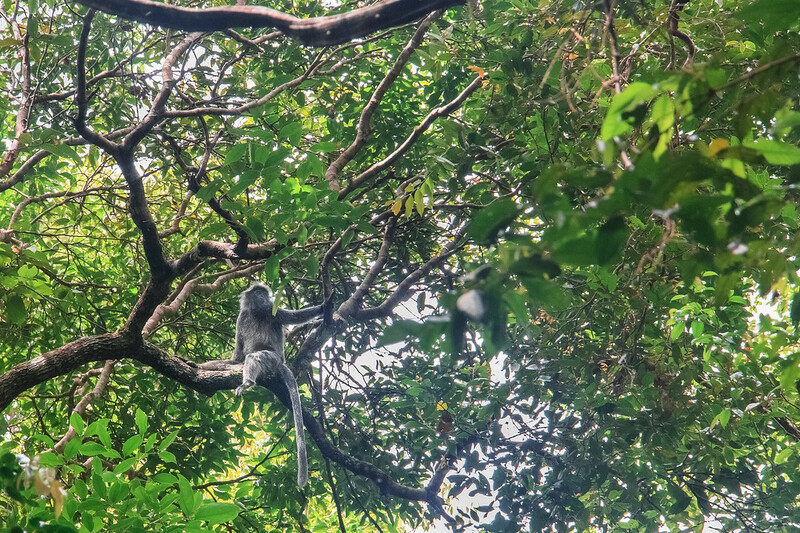 Silver Leaf Monkeys or Silvered Monkeys, are, like their names imply, of dark grey colour and are found in Borneo and parts of Peninsular Malaysia and Indonesia. 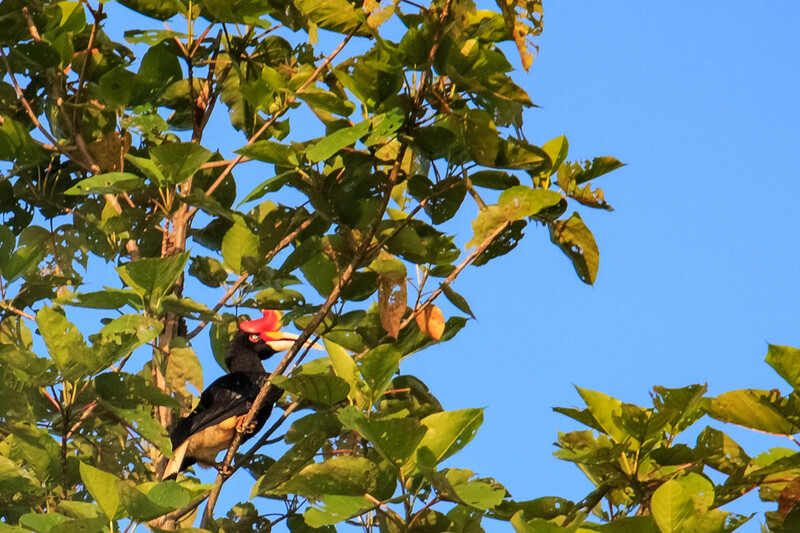 They are mainly folivorous, which means they eat leaves, but will also feed on flowers, seeds and fruits. It is considered a near threatened specie by the IUCN as their habitat is slowly being taken down for timbering and oil palm production. Macaques have a reputation of being cheeky and an annoyance to humans simply because they are smart primates, who will not hesitate to grab your backpack and steal your food ! 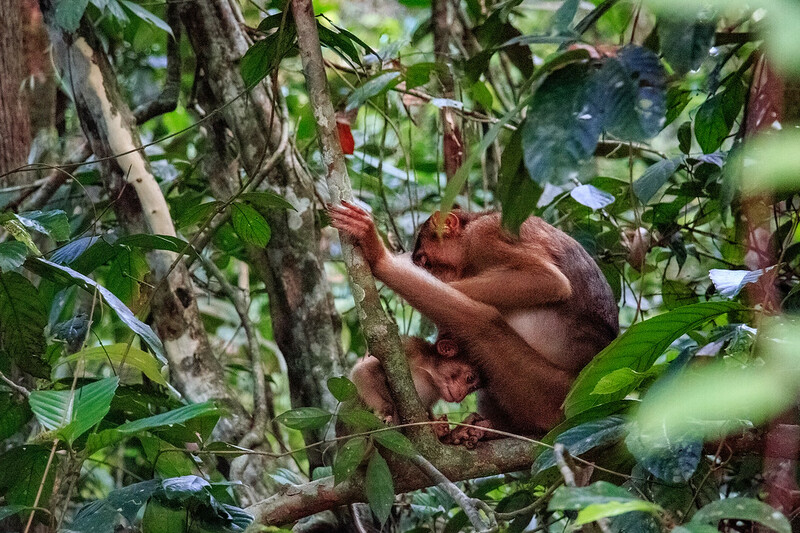 Pig tailed macaques and long tailed macaques are the two most common species of macaques found in Borneo. 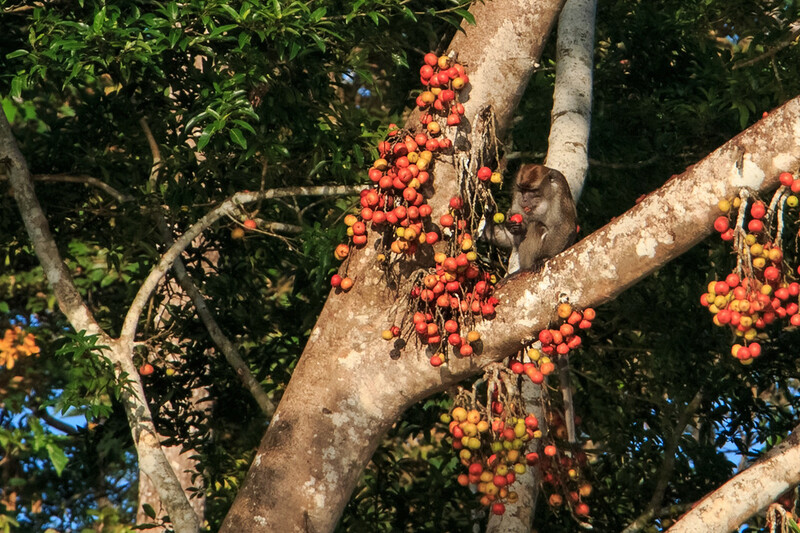 The Kinabatangan riverside is home to many macaques. 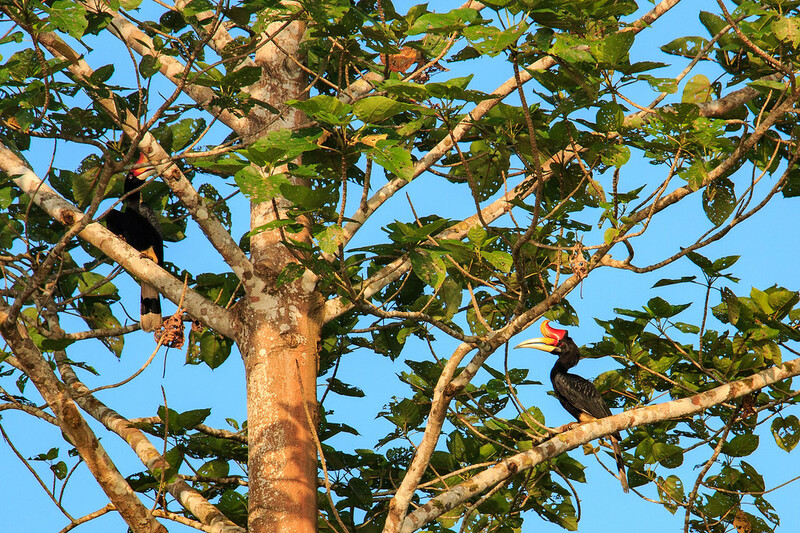 They sleep in groups, each in their own tree on the riverside and they huddle together to maintain body temperature. Macaques are frugivorous so they mainly eat fruits, but long tailed macaques also feed on crab and prawns. It is also hunted for pet trade, especially the babies with their golden hair colour. 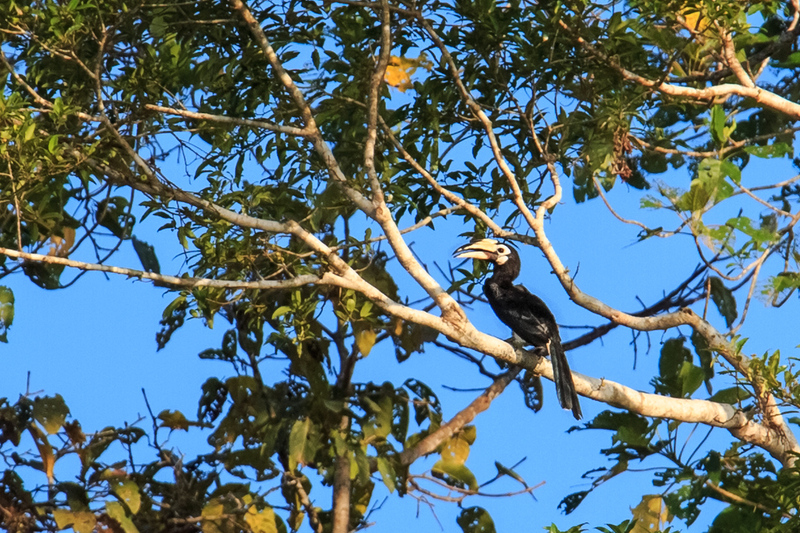 On the Kinabatangan riverside, it is very common to spot Rhinoceros Hornbills and Oriental Pied Hornbills, especially in the fig trees. The population is unfortunately declining quickly as they are hunted for their feathers used for traditional costumes. They also do not breed if there are no suitable cavities in large trees, and those large nesting trees are being removed. 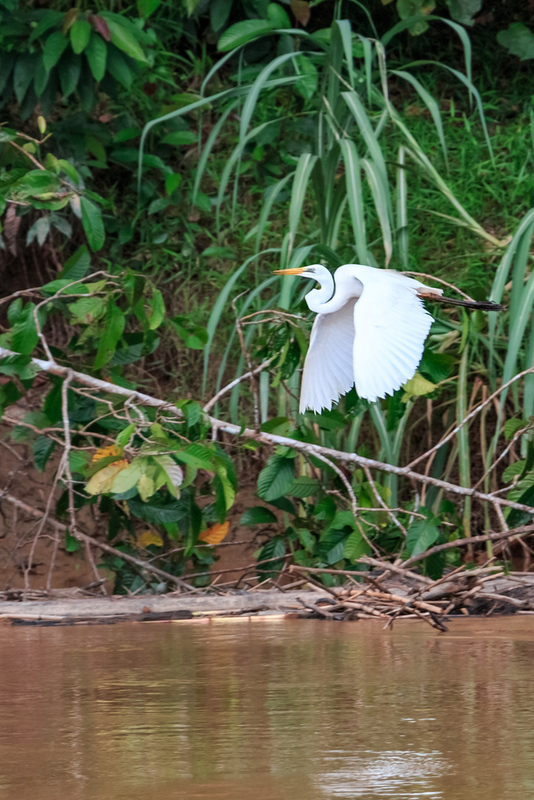 We spotted plenty of egrets during our Kinabatangan river cruises, it got to a point where we were not even surprised to see one anymore ! We mainly saw the Great Egret, Chinese Egret and Intermediate Egret. 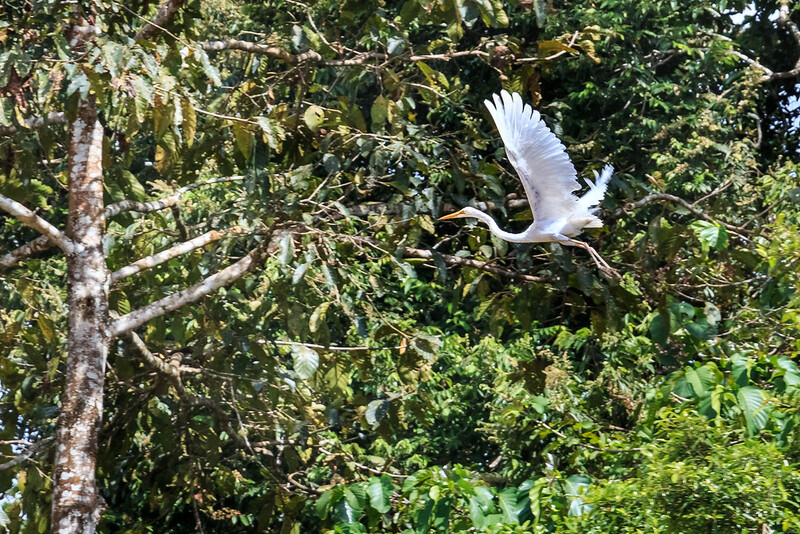 Egrets live and hunt near freshwater, brackish and marine wetlands. They mostly feed on fish but also birds, reptiles and small mammals. 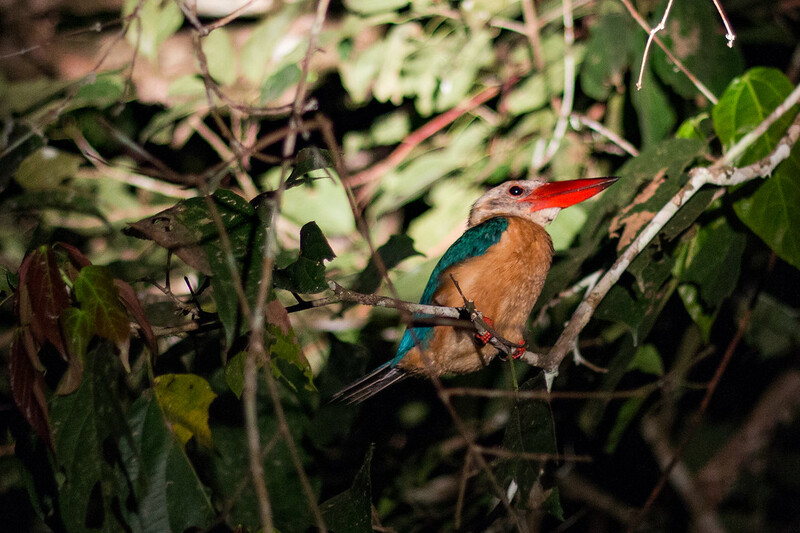 Species of kingfishers were also commonly spotted during our time in Sabah, especially on the Kinabatangan river. They are also found in mangroves and coastlines. 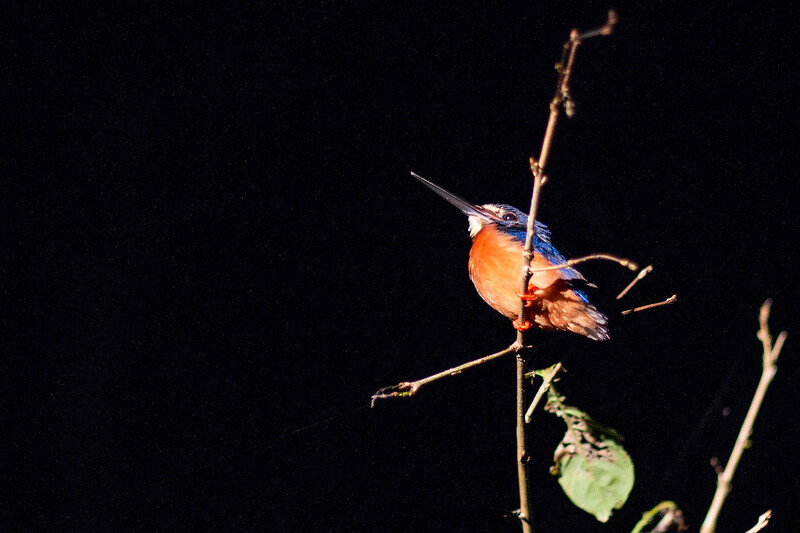 Stork-billed Kingfishers are the largest of all Kingfishers in Borneo with an approximate length of 35cm. We also spotted many times a few Blue-eared Kingfishers, again found along riversides, mangroves and coastline, and with an approximate body length of 16cm. Cruising at night on the rivers is obviously the best time to spot owls. 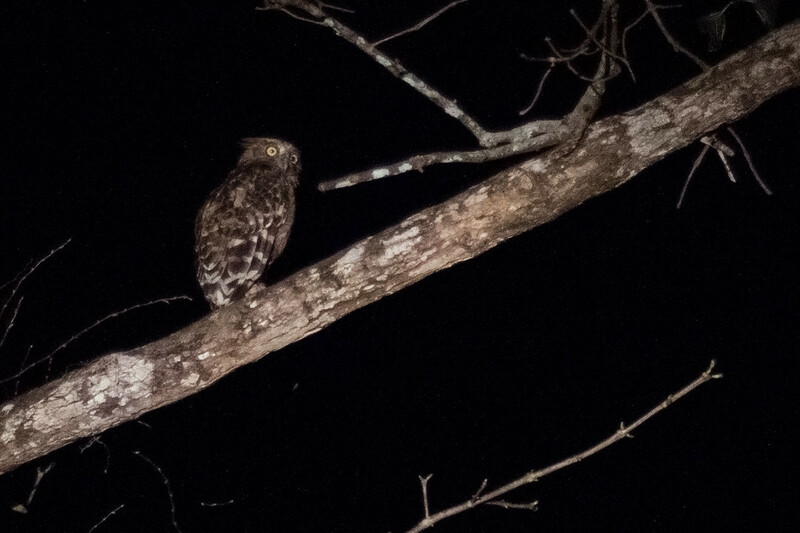 Alongside the Kinabatangan it is usually very common to see Buffy Fish Owl. 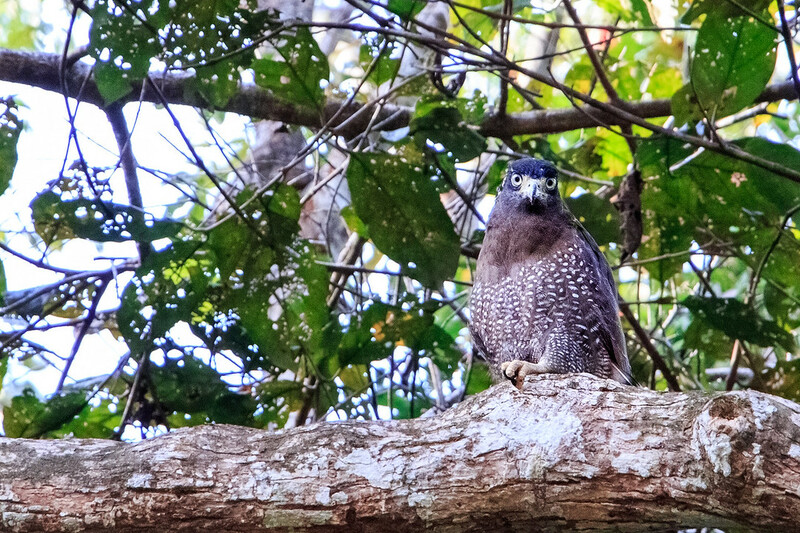 We spotted which I think is a Brown Hawk Owl, but I might be wrong ! Crested Serpent Eagles are a specie of bird of prey found in tropical Asia. They hunt snakes, hence their name, but they also feed on lizards, toads, frogs and small birds. They hunt and nest over forests, wetlands and rivers. 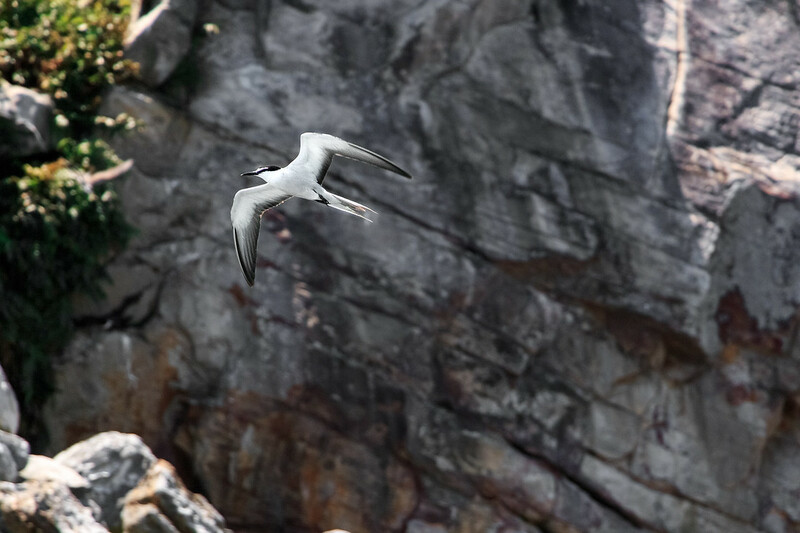 Sooty Terns or Wideawake Terns are migratory seabirds found in tropical oceans, usually breeding in colony on rocky or coral islands. We spotted a colony while out on a boat trip around the Kuching Bay, on a rocky island. As they are extremely common birds, they are not considered an endangered specie. 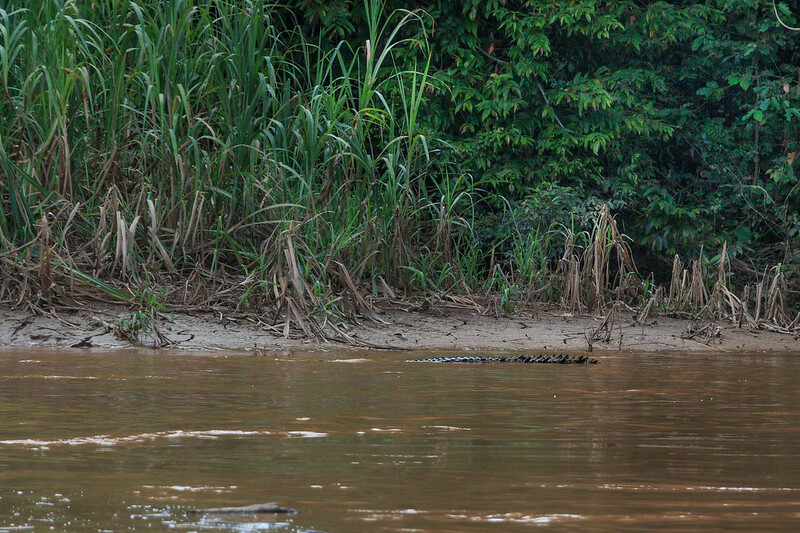 During our rivers cruises on the Kinabatangan we spotted a few saltwater crocodiles. Unfortunately we didn’t get the chance to take a picture as they immediately dived into the water. They measure between 2 to 5 meters, and are usually more active during the evenings and at night. There have been several reports of riverside villagers attacked by crocodiles in the Kinabatangan River area over the years. Green Pit Viper or Green Tree Viper is a specie of venomous pit viper endemic to Asia. 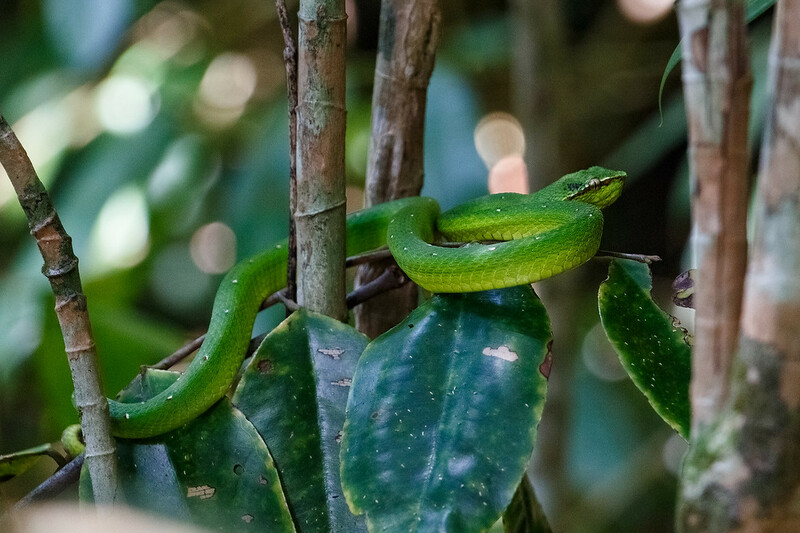 This nocturnal snake feeds mostly on frogs but also small mammals, lizards and birds. 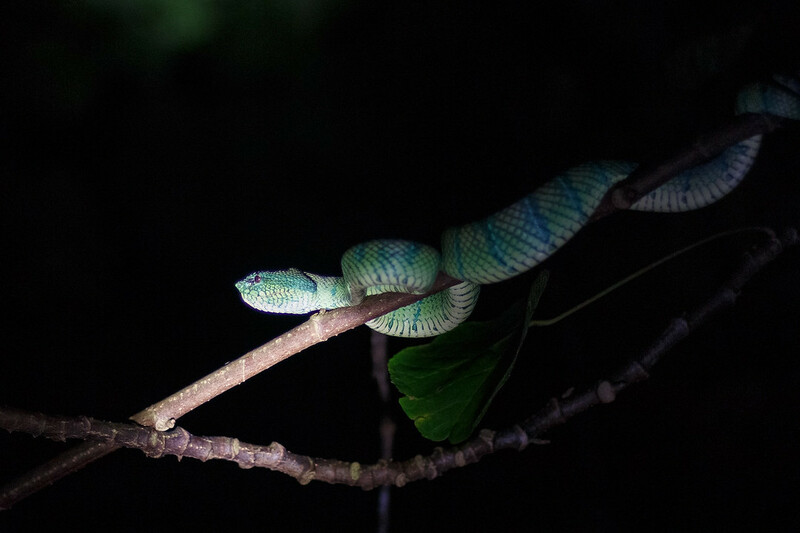 The Green Pit Viper is not an aggressive animal but its venom contains hemorrhagic toxins. And these ones were right next to us at Permai Rainforest Resort in Kuching ! 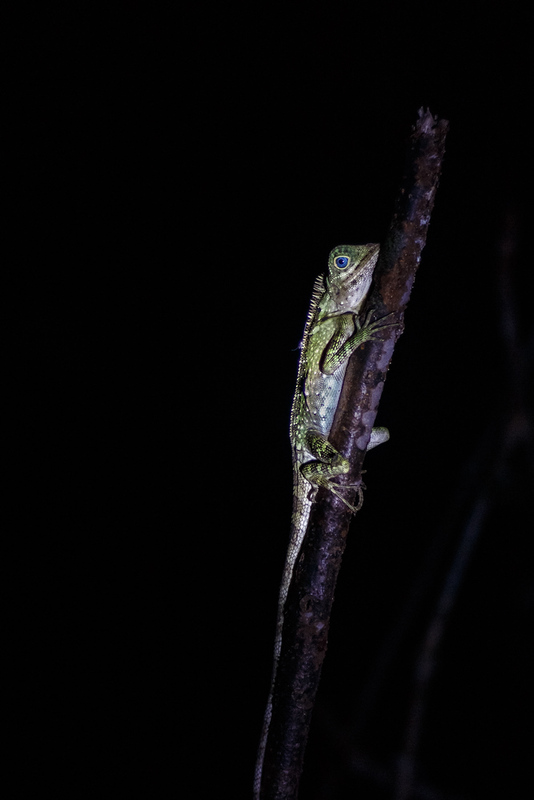 Blue-eyed Angle-headed Lizards are often seen on tree trunks, hunting insects. They have very distinctive deep blue eyes. We thought it was a cameleon at first as they look a bit similar. But our awesome nature guide at Permai Rainforest Resort was here to correct us ! 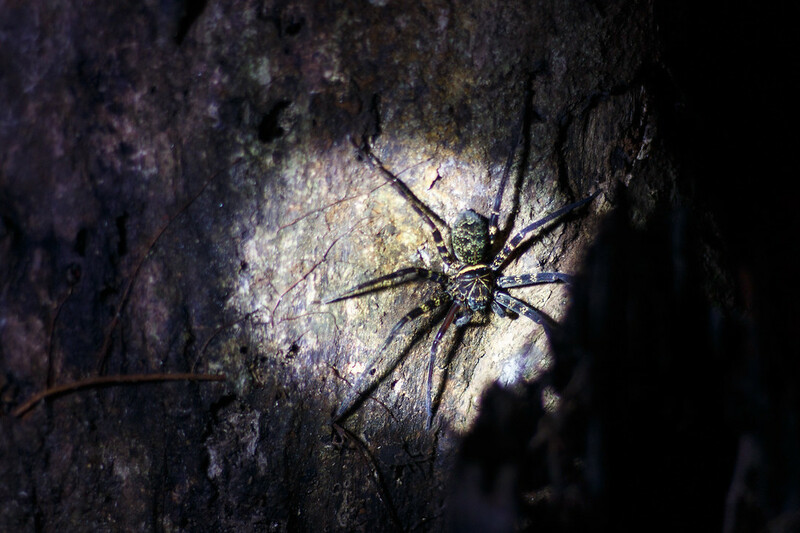 The name Huntsman Spider comes form their speed and mode of hunting. This nocturnal animal likes wooden places so it will often be found on logs and trees. They usually feed on insects like cockroaches and crickets. They are not aggressive unless they try to defend their eggs. Although their bite is venomous, it is not deadly to humans. 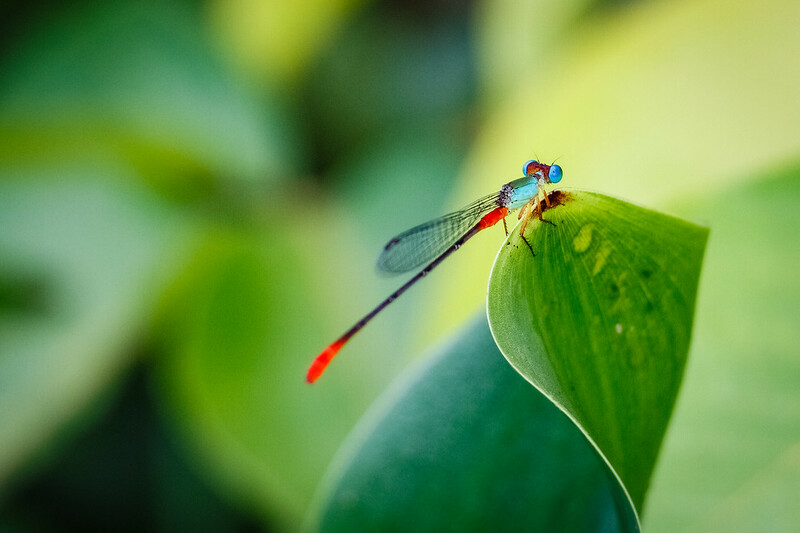 Did you notice how dragonflies fly away from us really quickly ? That’s because they have an extremely wide vision with around thirty thousand lenses ! Irrawaddy dolphins are oceanic dolphins that live in brackish waters. 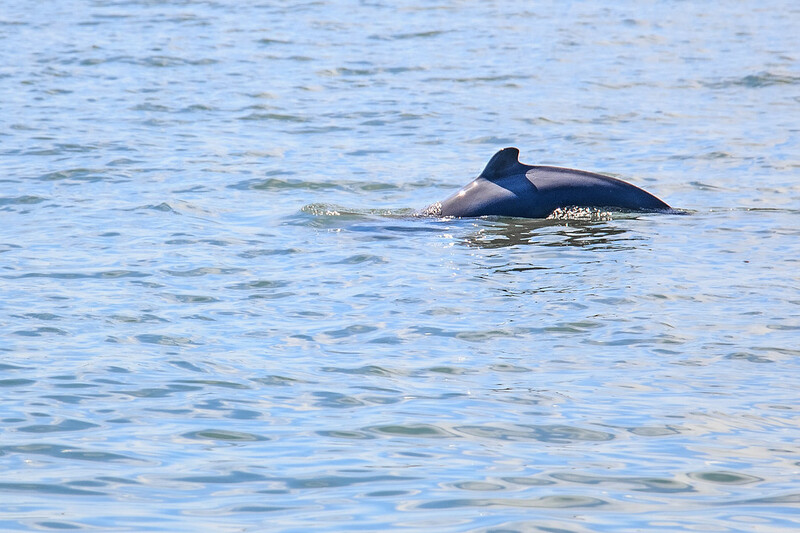 Compared to other dolphin species, they have a rounded head, a short beak and a dorsal fin located behind the middle of its back. They were a bit shy the day we went out on a boat trip around the Kuching Bay, so unfortunately I didn’t get a picture of their head, but only of their fins disappearing into the water. 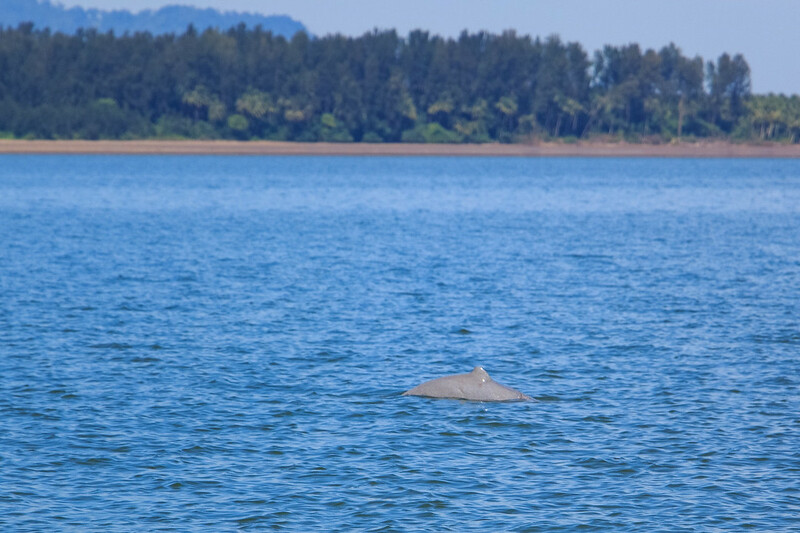 Santubong peninsula in Sarawak is a protected area for Irrawaddy dolphins, established by the Department of Forestry. 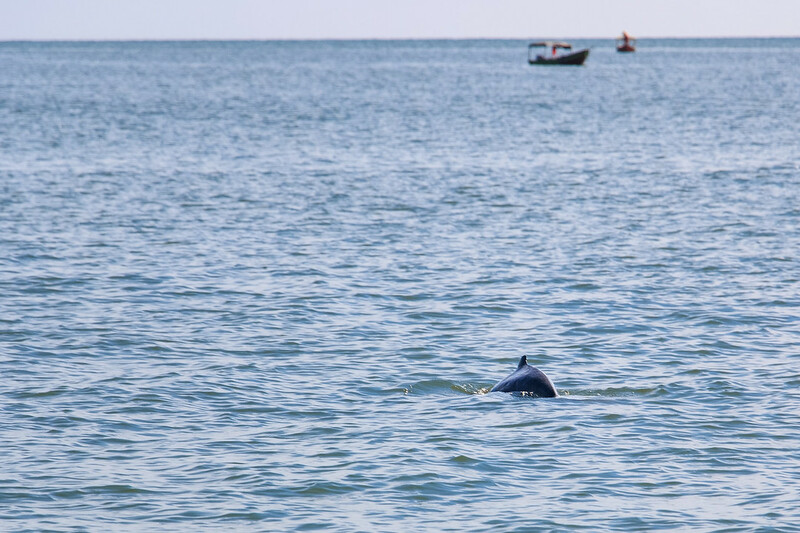 Today, the population of Irrawaddy dolphins in Kuching Bay is estimated at around 150 to 200. They are threatened by fishing, as they get tangled in fishing nets. Non ethical tourism and dolphin spotting tours can cause a threat to them as loud boats coming too close can be stressful. So remember to keep your distance, cut your engine off and let them come to you instead of “chasing” them. 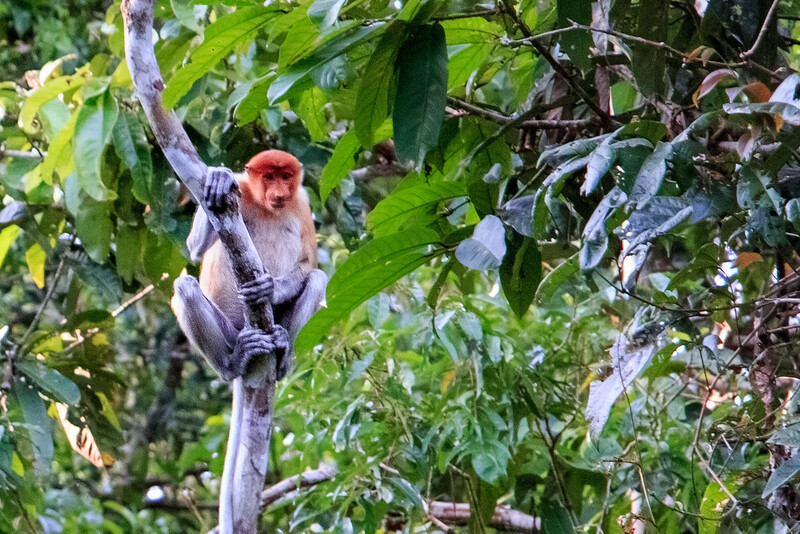 WWF works with the Brunei, Malaysian and Indonesian governments and collaborate with local communities, to protect Borneo’s biodiversity and find solutions for a more sustainable forestry and agriculture. You can help by donating or adopting an animal. More info here.